This week I crossed the threshold in which summer no longer seems to stretch out endlessly before me and I start to think about updating my fall classes. I’ll be teaching two, a graduate seminar on the Sociology of Environmental Health, and an upper-division undergraduate class on the Sociology of Food and Agriculture. Last year was my first time teaching the latter class. I have a few tweaks in mind for the readings compared to last year’s syllabus, and I intend to once again center the class project around teaching students how to contribute new content to Wikipedia. I was pleased with how the Wikipedia assignment worked out last year. The good people at Wiki Education helped me set it up before the class began by walking me through the various assignment modules they have available for instructors to adapt to their own purposes. Some are short assignments that teach students how to add images or citations to existing articles. I chose the most extensive model, in which students spend the entire semester learning how to, 1) evaluate existing Wikipedia content, 2) identify areas that need improvement, 3) read the existing scholarly literature on their chosen topic, 4) summarize that scholarship on Wikipedia, and, 5) respond to other Wikipedia contributors who may alter, delete, or add to their work. These are all transferable skills for traditional academic research, as well as for critical thinking, writing and collaborative work in general. The assignment also gave us an opportunity to discuss the social construction and politics of knowledge. Wikipedia contributors skew heavily white and male, and this impacts the kinds of content available on the site (articles on military history and video games are apparently particularly well-developed). This leaves a number of topics wide open for student contribution. Accordingly, one of my students created an article on Black Land Loss in the United States. Others added content to existing articles: one student added a description of the Freedom Farm Cooperative that Fannie Lou Hamer organized as part of her civil rights work; another added content on the challenges faced by female farmworkers to the Agriculture in the United States article. Another researched labor conditions on organic farms to add to the article on Organic Food, though her content was ultimately never added to Wikipedia. This assignment generated more student interest in assessing the credibility of what they read and supporting their own work with strong citations than I have seen in other assignments. Some of this is likely due to the fact that real people all around the world will read their work. Indeed, Wikipedia has become a massive online encyclopedia with global reach. The dashboard available to instructors tracks how many “views” there are of the articles that students create or edit. Less than one year later, the articles to which my students contributed have been viewed 661,000 times (actually, I suspect the number is higher – students sometimes added their contributions without remembering to sign in to their user profile first). While the Wikipedia protocols for adding content and interacting with other users are a bit cumbersome to learn, I was impressed by how much support Wiki Education offers. Beyond the adaptable assignment modules and training videos they have created, they also assigned my class two staff helpers. The helpers were on hand throughout the semester to answer my questions and to interact directly with my students, they even provided direct feedback on their writing. This semester I’ll make an effort to streamline my assignment somewhat, which ended up confusing myself and the students with a few too many due dates for editing and revising. Beyond that, I plan to stick with last year’s winning formula. If you teach with Wikipedia, I’d be interested to hear about your experiences. And if you teach Food and Agriculture, send your students over to my students’ work to continue to improve upon it. Today was the first day of the fall semester here at Howard University, and also the first day of my new class: Sociology of Food and Agriculture. Check it out below! Students, if you are still looking for a class to take, I have room in this one so come on by. We’ll be applying our sociological imaginations to something we all do every day but don’t always think that much about: eating. To do so we’ll read about the origins of the US food system, labor organizing, the industrialization of the food system, land ownership and loss, shopping, eating, and hunger. We’ll also be using what we learn in class to contribute to Wikipedia with the help of the good people at Wiki Education. Instructors, if you are interested in incorporating a Wikipedia assignment into one of your courses, Wiki Education has a lot of tools to help you do so – everything from sample assignments to training videos and semester-long timelines. They also offer individualized class support to you and your students. As usual, thank you to everyone who helped me think through what to assign in this course. Friends, colleagues, the Food and Agriculture Specialty Group of the American Association of Geographers, and the Critical Race Theory and Food Studies list run by Breeze Harper all contributed. I chaired a panel discussion on “Overcoming Corporate Threats to Academic and Community Research on Industrial Animal Production” earlier this month at the annual meeting of the Association for Environmental Studies and Sciences. The panel was organized by Zoe Ackerman at the the Rachel Carson Council. It focused on the experiences of people whose health is impacted by the North Carolina hog industry. More specifically, panelists discussed industry intimidation and legal tactics designed to suppress research on the health impacts of concentrated animal feeding operations (CAFOs) on their nearby human neighbors. Steve Wing, the leading scholar on this topic, was part of the panel design, but in the end was unable to join. However, the following panelists gave a great overview of the issue and how it relates to broader threats to research in the public interest. Keep an eye out for more work to come on this subject coordinated by the Rachel Carson Council. Also look out for announcements about the North Carolina Environmental Justice Network’s annual summit. In the meantime, the video below provides a short overview of our conversation. See also the following pinterest board where I collected articles I used to inform my framing remarks, which are not included in the video. I linked Steve Wing to Ignacio Chapela, William Cronon, Tyrone Hayes, and Anita Sarkeesian, who have all experienced serious push-back from the industries and social groups threatened by their research. Like many of the other panelists, I emphasized how industry relation against scholars has a chilling effect on the kinds of questions that we ask. This spring I taught a new class in the Community Studies program at UC Santa Cruz called “Making California.” Overall, the idea was to teach students about key moments in the history of California in order to help them better understand and intervene in current events. I used C. Wright Mills’s concept of the sociological imagination as a foundational theory to help students understand how individual lives are shaped by the broader historical and political context in which they exist. We also paid attention to how social movements have, in turn, helped people to change the political context in which they live. A second key theme of the course was California’s racial history and recent transition to majority people of color state. Finally, we spent a lot of time thinking about California’s role in the nation and world. This meant we read about both how the state has influenced events outside of its borders, as well as been influenced by the broader world. For the core class assignment, students analyzed a key moment in California’s history by explaining what happened, what led to the events described, and the current relevance of those events. They were tasked with writing for a public audience, and crafting an introduction to capture a reader’s interest and draw them in to reading the rest of their essay. Students presented their work orally, and in historical order, at the end of the course. In this way we created a partial, “People’s History of California.” The written component of the assignment took the form of multi-media essays they wrote on websites of their own design (more on this assignment in my next post). This assignment was inspired by conversations with Ildi Carlisle-Cummins about how we could incorporate her new project, Cal Ag Roots, into the class. The launch event for Cal Ag Roots will involve telling the story of three key moments in the history of California agriculture. So, several of my students chose her stories as their “historical moments” to work on for the purpose of the class assignment. Their work therefore supplemented her own background research on these three key moments. I drew on syllabi developed by Julie Guthman and Lindsey Dillon to help structure the class. See my own syllabus below. 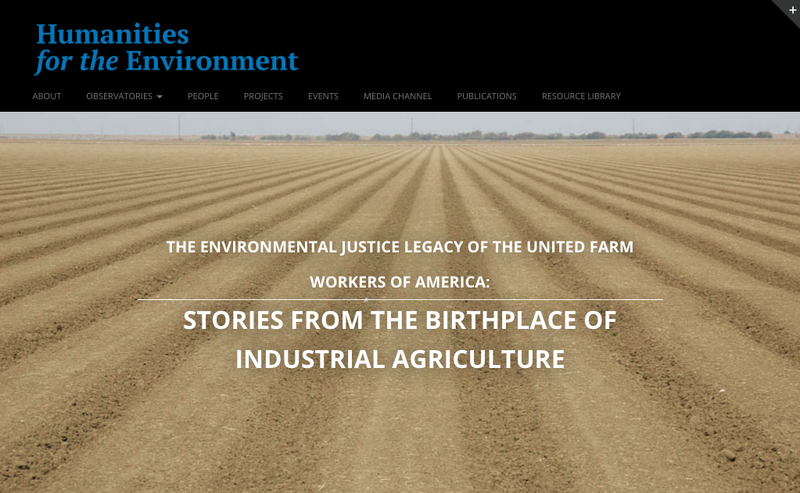 I’m happy to share my digital essay “The Environmental Justice Legacy of the United Farm Workers of America: Stories from the Birthplace of Industrial Agriculture.” It is published on the new “Humanities for the Environment” web platform funded by the Mellon Foundation, the Consortium of Humanities Centers and Institutes and by Arizona State University’s Institute for Humanities Research. I’m particularly excited to share the reflections of activists Lupe Martinez, Mary Lou Mares, Sarah Sharpe and Enrique Martinez in it. Thank you also to Zachary Singer for allowing me to use his photos of environmental justice activism in the 1980s and early 1990s. Note (6.6.18): The Humanities for the Environment website continues to be redesigned. Find the latest url to my contribution here. 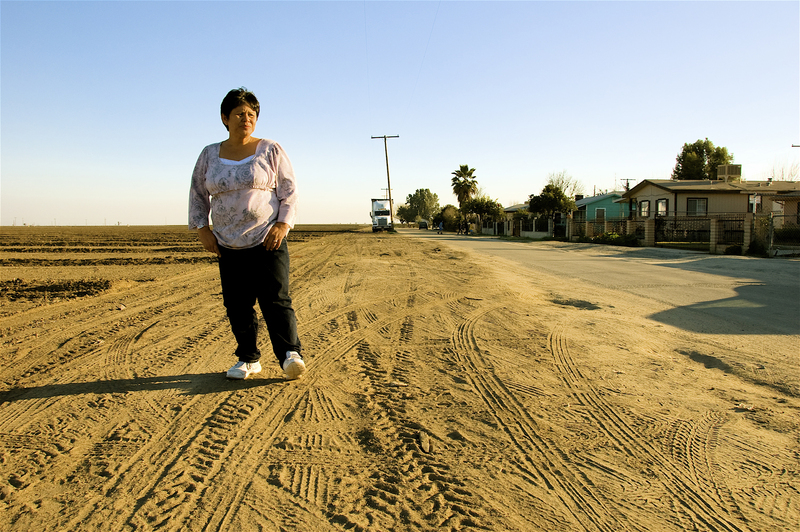 Today I released a new digital project to honor the memory of California pesticides activist Teresa De Anda, and to help educate the public about the problem of pesticide drift. In Her Own Words is an expansion of the blog post I wrote the day before Teresa’s memorial service last fall. It includes photography, new and previously published oral history, suggestions for readings to use with the website in college classrooms, links to resources to help address the problem of pesticide drift in community settings, and a short essay I wrote about Teresa. Thank you, Valerie Gorospe, for allowing me to continue to work with your mother’s stories, and to share them with others so they might learn from everything she accomplished. Thank you also for your support Linda MacKay, Lauren Richter, Tracey Brieger, Sarah Aird, Tracey Osborne, Rachel Deblinger, Zoe Stricker and Evelyn Torres Arellano. 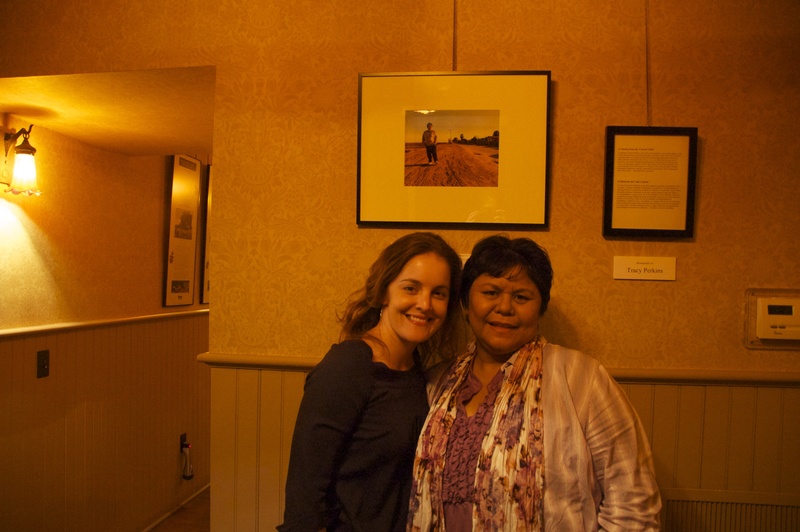 With Teresa, in front of a photo I took of her, at an exhibit of my photography in Fresno. February 10, 2011. 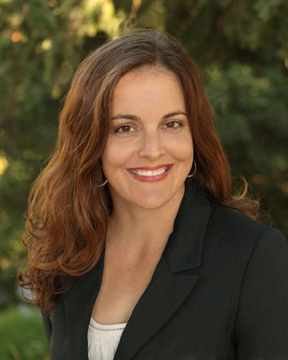 I first met Teresa DeAnda in 2007 when I sat in on one of the monthly meetings of the Center on Race, Poverty and the Environment’s Delano Advisory Board. I was there to describe my master’s research and ask the community leaders on the advisory board if they would be willing to participate in it. At that time Teresa was the group’s president, and she was quick to say yes. I learned over time that this generosity of spirit was core to who she was. As she has done for so many others, Teresa invited me into her home to tell me about her life and her work. Over the years I continued to get to know Teresa through photographing her, through her participation in Voices from the Valley (formerly called 25 Stories from the Central Valley), and through the many other environmental justice events that led our paths to regularly cross. I came to know her as generous, fierce, and a lot of fun. Teresa lived next to vast fields of industrial agriculture. When we first met she told me about the regular pesticide drift she experienced in her home in Earlimart. She told me about how many people in her community had cancer. She later got cancer herself. Her death at 55 is made doubly tragic by the fact that it is hard to think of her illness as random, rather than as part of a consistent pattern of toxic exposure in politically marginalized communities. Much of her life’s work involved changing this pattern. 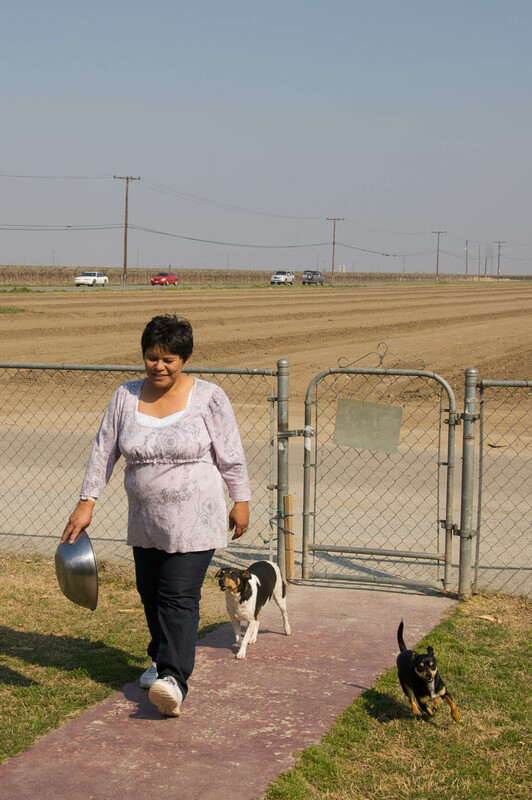 Her efforts helped put protections into place that limit the drift of pesticides into residential areas in a number of San Joaquin Valley counties, and that improve emergency response to pesticide drift incidents statewide. She was a bright light whose loss will be deeply felt. So others might also know of her life and her legacy, I have collected below previously published excerpts from my 2007 interview with Teresa, along with some of my favorite photos of her. I have also included links to other testaments to her life, as well as information for her memorial service in Delano tomorrow morning. Our street was the first street to get evacuated [after the pesticide drifted off the fields and into our neighborhood]. I’d driven to Delano, and when I came back there was a sheriff standing at our gate. It had just gotten dark, and my husband said, “We need to get out, because there’s something happening.” I smelled it a little bit, but I didn’t smell it that strong. But I was still very disturbed. It’s a horrible feeling, getting told you’ve got to get out, that there’s something that you shouldn’t be smelling. I got the kids, and we left in the van. My husband got my blind uncle and my 87-year-old compadre, and then we drove. But I was just so fearful for the people that were staying. Days later, we found out what happened to everybody. I had read the newspaper, but it didn’t mention what happened to the people that Saturday night, November 13, 1999. On Wednesday the UFW [United Farm Workers] had a meeting and they had all the agencies there: the county air commissioner, the fire department, an expert on pesticides, Pesticide Watch. It was just packed with mad, angry people. That night, I found out what had happened when we left. [When the pesticide drifted over the town] the people who were the sickest, they were told to go to the middle school. And at the middle school they told the men, women, and children to take off their clothes and go down the decontamination line. Keep in mind: these people were vomiting and had burning eyes, just coughing and coughing, and so they were scared to death. They were given no privacy, just two tarps on either side, and they were told to take off their clothes. And the people didn’t want to. One lady said, “Where’s my rights? Where’s my rights?” They told her, “Listen, you have no rights tonight; you’ve lost your rights.” And so she took off her clothes, and she said that that was the worst feeling in the world, because her kids had never seen her without her clothes, and they could see her. This is indicative of how they did the decon [decontamination]. She took off everything, absolutely everything, but she wouldn’t take off her underwear, so they yanked it off. They yanked off her Nikes, and so there she goes through the decontamination line, which was a fire-department water hose, on a cold November night. A fire-department water hose with a guy standing there holding it. She went through one line and then the other, but they didn’t wet her hair. At the end of the decon line they were supposed to have ambulances waiting, but the ambulances weren’t there yet, so they just gave them little covers and told them to sit on the ground. So I’m finding all this stuff out at the meeting. All these mad people are just yelling at the agencies, telling them, “How could you do this to us?” And then they told us what had happened at the hospital. The people did get transported to the hospital. Some went to Tulare Hospital, some went to Porterville Hospital, some went to Delano Hospital. Well, the lady with a lot of kids, she was baby-sitting kids too, they couldn’t take all of her kids to the same place, so they wrote their phone numbers on their stomachs, like they were animals. At the hospitals, they took their information, their names, their number, their address, but they didn’t even triage them. The doctor called poison control, and poison control said, “There’s nothing happening to them, just tell them to go back home but to try not to get re-exposed.” That’s all poison control told them. So they were sent on their way and they were given the clothes that they had been in before they got decontaminated. They just gave them back to them. Didn’t have them cleaned. So I started learning more and getting more and more angry. I couldn’t sleep at night, ’cause I was so upset at how it had changed my kids’ health and my health. When I was growing up, my dad had always said, “Trust the government. The government’s never going to lie; the government’s good,” and all that. And I thought, “No, they’re not,” because they really let us down that night, they really, really let us down. So much for trusting the government. I couldn’t sleep at night because it bothered me so much that it happened and that still nothing was being done about the people who had gotten sick. I learned a lot about pesticides. And then at press conferences they would always ask me to speak. Even though I wasn’t one of the victims that got deconned, I was one of the ones speaking all the time. They were calling me for meetings and conferences and stuff to talk about what had happened. Once there was a guy spraying, it was May, 1999, and he was spraying over there and the fog was in the house. He wasn’t even turning off the tractor rig when he was coming up the road. The stuff he was spraying, it was in the house. My kids were all puking, my husband was out of town, so it was just me here. I didn’t know to pick them up, take them to the van, and get them out of there. It looked like London fog out there, and in here it looked like San Francisco fog. I didn’t know whether to leave them sleeping, or to take them out to more danger. So I called the fire department, the sheriff, and they both said the same thing: “The farmer has a right to farm. You can’t complain about this.” And I said, “But I don’t know if we’re going to die or live or what. This stuff, it’s really bad out here. I know he’s got to spray, I realize that, just tell him to turn the things off when he’s coming out of the vineyards.” You know what a tractor rig looks like? Kind of like a monster. It’s a noise, and then you look out, and then there’s lights. It was in the night, so they said that they couldn’t come out. I said that you’d better come out here and at least look at this. I wanted it on record that I called them. So she got in her van, and she drove out. And at that time, other people slammed the phone down. When they saw people leaving, they slammed their phone down, and they got out, and they were leaving too. And so there was a caravan of vans. They drove out to Sunset and Weed Patch. And on the corner, it was barricaded. It’s called a stop and freeze, or freeze and keep whatever is contaminated in. They were telling people “Go back, go back, you can’t come out.” And they’re like “No, we’re sick, and need our kids to get to the doctor. We’re going to drive them ourselves, cause we’re not going to wait for you any more. We were on the phone for close to an hour with that lady, and she was just telling us to sit down, to calm down, and that we were talking crazy and stuff, but no, we’re going to get out.” And there was a lot of people that spoke Spanish. So one of the men just went on the dirt and drove off. Broke the barricade. I wanted to talk to the people and let them know that when the doctors and the agencies, like the fire department or whatever, tells you it’s nothing… because they will, they’ll tell you it’s nothing. They’ll say “Oh, it’s mass hysteria, you’re hung over,” or, “It’s just something you ate that’s making you nauseous.” No, it’s the pesticides, and don’t doubt it. It’s the pesticides. Then I always want to tell them that they need to report drift. It’s state law, drift is illegal, it shouldn’t happen. The farmers spray the field, it leaves the field, goes on your car, goes on your property, goes on the park when you’re there. You need to report it. I’m trying to get it across, but people still don’t call. The numbers are so low for reports. I was at a meeting with the county agricultural commissioner, and we were looking at maps of the agricultural land. I saw these little red dots on the map and asked what they were. He said, “Those mark where the bees are, they’re the buffers.” I said, “The bees have buffers and we don’t? !” He said, “Teresa….,” but I was serious.